A shipping company from the Far East has ordered four electro-hydraulic grabs for their new-build project. The delivery will take place in late spring 2013. The shipping company knows ORTS grabs from former projects and a lot of their bulk carriers are equipped with ORTS electro- hydraulic grabs. 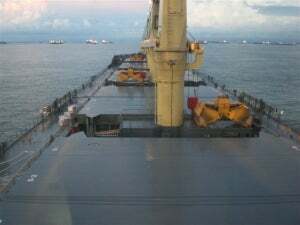 In difficult times they prefer to have the best available equipment on board to be more competitive and faster than other bulkers. It transpired that the ORTS grabs in the company’s fleet have a lower spare part consumption than the grabs from other makers, which helped the company to choose ORTS again.